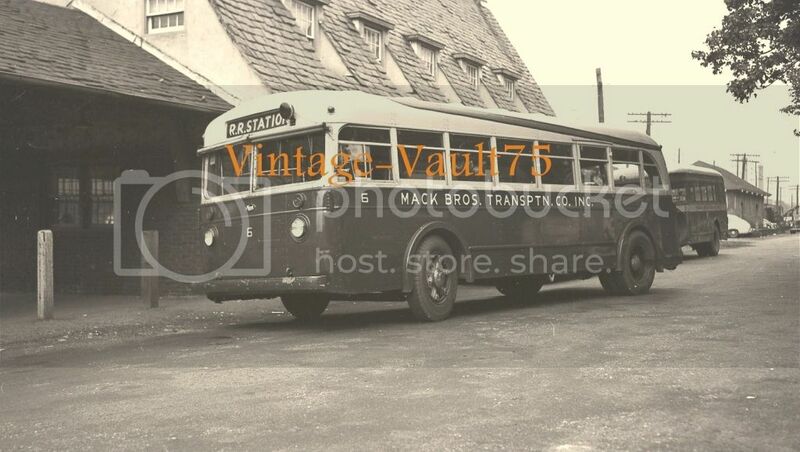 Mack Brothers Transportation Co., Inc. (no relation to the bus manufacturing family) was a one time small local Long Island operator serving the south shore communities of Baldwin and Baldwin Harbor with both transit and school contracts. 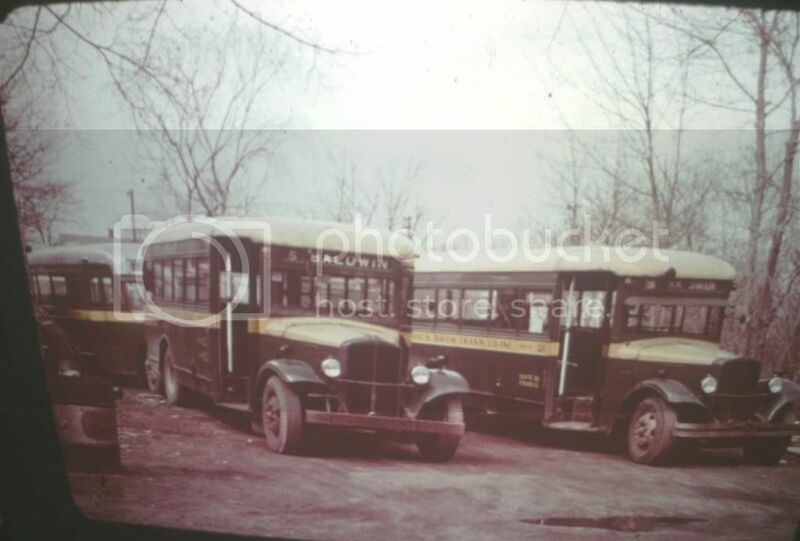 Pictured below (top) is fleet # 26 - a 1933 Indiana Model 14C and one of an unknown few (if any others at all) purchased used in 1938 from Green Bus Lines of Jamaica, New York. 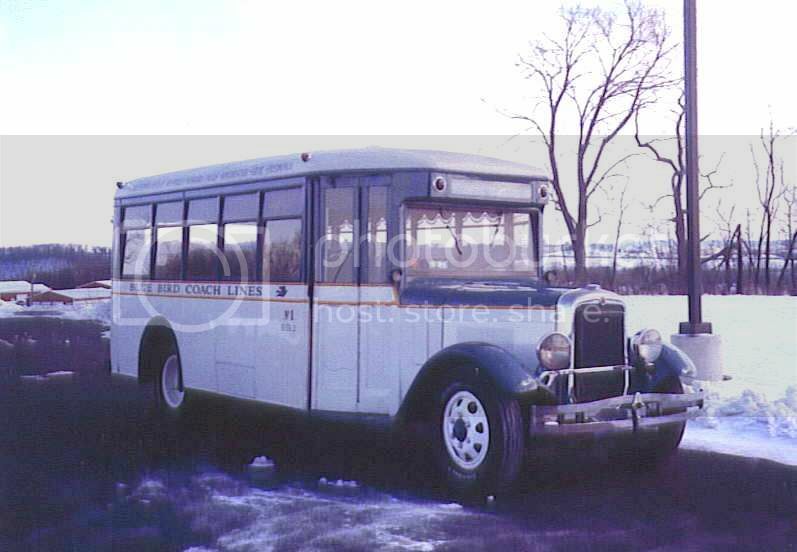 Built in Cleveland, Ohio and sporting bodies by Bender, the Indiana line was White Motor Company's light duty offering and was ideal for low volume feeder routes. Green Line had originally purchased fifty of the 14C's to help fulfill a franchise obligation in Manhattan and, while they were solidly built and ran well, their 25 passenger capacities were soon obsoleted by the company's rapid growth and they were replaced in 1938 by thirty-five 37 passenger Mack CT's. Of note on #26 is the rather steep passenger step well, the porcelain plated hand rails and, because of war footing, no front license plate and the once chromium plated radiator shroud painted so as to be a less attractive target to enemy bombers. The lower frame below shows a 14C in full Green Line dress heading eastbound and just crossing Broadway at Chambers Street in Lower Manhattan. Upper photo courtesy of eBay. Lower photo courtesy of NYPL Digital Gallery. L. B. Cropper, owner of both Di Leo Bus Company established in 1932 and serving Freeport, New York and Mack Brothers Transportation Company established in 1927 and serving Baldwin and Baldwin Harbor, New York, had filed for bankruptcy last month (December 1951) and has now been ordered by the court to cease operations of both companies. The Hempstead Bus Corporation of Hempstead, New York has been appointed by the court to temporarily take over the routes. 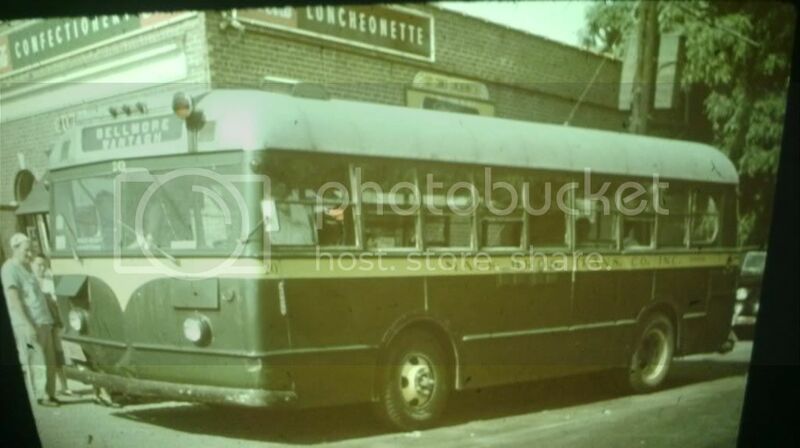 A couple of more great Mack Brother's Transportation Company photos in color. Top; Mack Brother's fleet number 20 - a Ford Transit Model 29B of early forties vintage in an image taken in July of 1949 - notice the destination sign as Bellmore/Wantagh. Bottom; Mack Brother's fleet numbers 5 (center) and 26 (right) taken at the company's Baldwin yard date unknown. 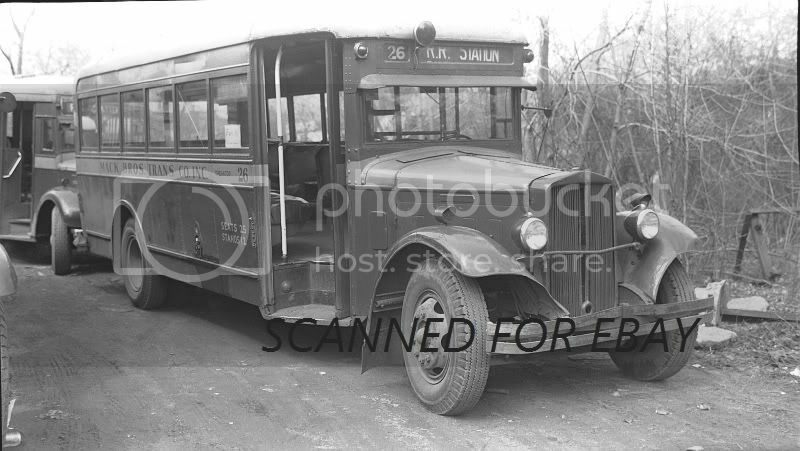 Both #5 and #26 are ex Green Bus Lines (NY) 1933 Indiana Model 14C's. Images courtesy of 2009 Transitman and are up for bid on eBay as item # 300679074308. 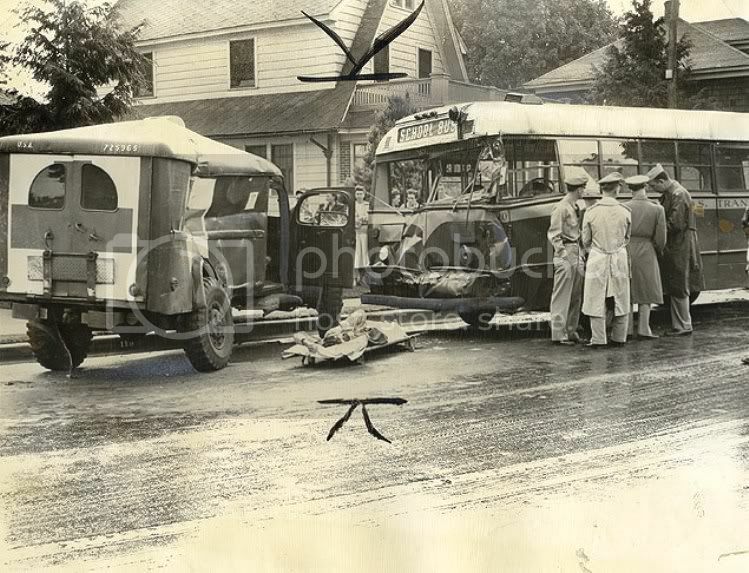 I'm sorry to report that the Mack Brother's Ford Transit #20 that is shown in the last post above met with disaster only two month later in a collision with a U.S. Army ambulance in Hempstead (L.I.) while in School Bus service on September 14th. of 1949. As can be seen below, there was at least one injury with a victim on a stretcher awaiting another ambulance. In that Mack Brothers was already in the throws of bankruptcy, it is doubtful that #20 was ever rebuilt by them. Photo from the New York Journal American Photographic Morgue taken by Platnick. Seen at the Baldwin, Long Island railroad station (pre elevation) along Sunrise Highway and waiting for its next trip to downtown Baldwin and Baldwin Harbor is fleet # 6 - a 1939 Mack Model CW-3G operating for Mack Brothers Transportation Company, Inc. of Baldwin, New York. As with most of the rest of the company's small fleet, # 6 was bought used as no listing in new Mack production can be found, and the lack of a front plate may indicate a war time photo. Of note were the still optional horizontal sweep sets of windshield wipers for each glass and a combination manufacturers badge and company monogram under the windshield (only by coincidence!). You can learn more about the history of Mack Brothers in earlier posts in this thread. Photo courtesy of 'Vintage-Vault75' and is up for auction on eBay as item # 181074502513. Just found this great site.I appreciate Mr.Linsky contributions very much. I grew up on 165th st.backing up to the North Shore Garage.We moved to Baldwin in '48/'49 and were served by one of the smallest bus lines in L.I. the Mack Bros,which had the school contract and served North Baldwin and Bay Colony in Baldwin Harbor. The shock was seeing the front engin buses of such vintage still running.Run they did,you could hear them blocks away,but I never recall them missing a trip,rain or shine. The indiana was Berts bus,an International was driven by Sonny,his son. The Ford #20 was Ed Sumpf's and the Yellow "U" was Mr.Mundy,s.Mr.Mundy was the most popular and nicest driver of them all.The others were nice but kind of quiet.....Every train was met and half hour service between rush hours. This remained so up till the school bus contrat was changed and awarded to another company. I was told that Mack,along with DiLeo was owned by Nick Sempke,no other name was ever mentioned...More to come..Thxs. P.S. Mr.L.Just after the war I was told that Greens best route was The Q11,then the Q8,does that soyund right to you? Thanks for the compliments - they are always greatly appreciated. It doesn't surprise me that Mack Brothers' little Indiana's ran for as long as they did and the only reason that Green Line sold them early on was because of lack of capacity. The Q-60 (Manhattan to South Jamaica via Queens Boulevard) has always been one of the longest, busiest and most profit making (with two zones) of Green Line's routes followed by the Q-10 (Lefferts Boulevard) which, once the then Idlewild Airport (now JFK) opened in 1948, became the second in line. 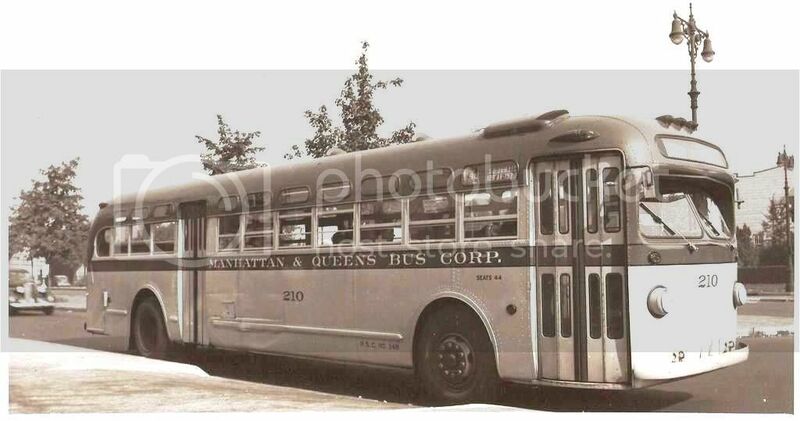 The Q-11 between Queens Boulevard and Howard Beach via Woodhaven Boulevard, which was a comparatively short route, never really had great volume revenue wise and, in fact, was one of Green's lines that was cut back during the war years due to rationing of fuel and tires by the government. The Q-8 (Ozone Park to Jamaica via 101st. a/k/a Jerome Avenue) did quite well especially carrying loads of shoppers to Jamaica during daytime hours. A little known fact about little known bus of a little known company in a small little village on Long Island. Mr Mundy's Yellow Coach model"U" was sold by Nick Sempke to Blue Bird Coach of Olean New York. The keepers of the flame restored it in 1981. If you ever go to Hershey PA. it is on display at the Museum of Bus Transportation. Model "U" was built from 1928-1935.Blue Bird dates it at 1934,while MCA in Oct.83 put it at 1928. Mr.Mundy must be looking down from that great bus depot in the sky,with a great deal of pleasure.People all over can see it in Robert Redford's "The Natural" Does ever get better than that! Thanks to Mr.Mundy,Nick Sempke,and Blue Bird. Enjoy! I believe you must be talking about the attachment below. I did a piece on this Semke/Blue Bird Yellow Model 'U' elsewhere on this site some years ago. Posted: Thu Mar 28, 2013 11:56 am Post subject: Mack Bros.
To my knowledge, you are one of few living people (including myself) that have ever seen a Green Line 1946 TD 4506 carrying a fleet number between 201 and 210 and the flag of Manhattan and Queens Bus Corporation in action (facsimile seen attached). 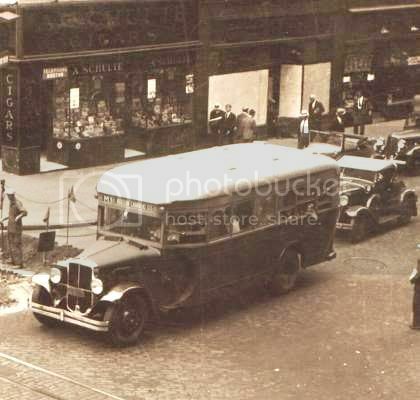 You are correct when you say that it must have been around 1946 because that's when those buses were delivered and flagged for M&Q and only until 1947 when M&Q's PSC certificate expired and Green Line gained the franchise. In fact, on # 210 pictured, you can see the PSC certificate number just aft of the front wheel well and under the side swipe molding. Photo courtesy of Dennis M. Linsky (no relation).